Rich Heffron is a PhD Candidate in Islamic History at the University of Chicago and an HNN intern. He conducted this interview by email. 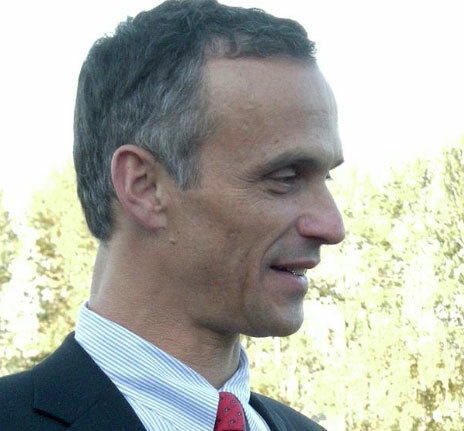 Michael S. Roth is president of Wesleyan University. Previously, he served as director of the Scripps College Humanities Institute, associate director of the Getty Research Institute, and President of the California College of the Arts. As a historian, curator, professor, and author, Roth’s work has revolved around the question of “how people make sense of the past.” His previous publications include: Psycho-Analysis as History: Negation and Freedom in Freud (1987); The Ironist’s Cage: Memory, Trauma, and the Construction of History and Memory (1995), and Trauma and History: Essays on Living with the Past (2012). Roth is a frequent contributor to the Huffington Post and he blogs at Roth on Wesleyan. 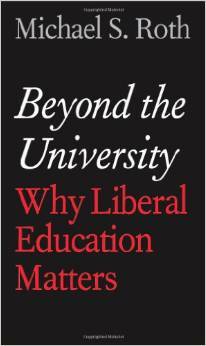 His most recent book, Beyond the University explores the centuries long debate in America over the value of liberal education and why it matters moving forward in the 21st century. When did you come up with this book project and what was the major inspiration behind it? I began thinking about this project just over three years ago as I was finishing a collection of my essays, Memory, Trauma and History: Essays on Living With the Past. I was reviewing a book on the Dreyfus Affair and happened upon the Yale University Press series Why X Matters. As president of a university dedicated to liberal learning, and as a historian, I thought it would be worthwhile to write on the deep legacy of liberal education in the United States. The fact that so many were talking about jettisoning this legacy was, of course, very motivating in this regard. That motivation eventually trumped my hesitation to write on American history, since all my work up to now has been in European history. As you outline in the book, the debate over the value of a liberal education in America has been ongoing since the days of Jefferson and Adams. Do you believe that liberal education is under a greater threat in the 21st century than it has been in the past? Yes, I do believe the threats are greater now than in the past. Today, the combination of extreme economic inequality, technological change, and pessimism about the future have fueled forces that would like to see some people have only a technical education that will serve them in the short term. The expense of higher education also motivates those who are looking for short cuts. But we can find more cost-effective ways of creating environments that teach a broad, contextual curriculum even to those who have specific needs for skills of a certain kind. All Americans should have an education that prepares them for citizenship and for continuing to learn after their formal schooling stops. You argue that a “broad based, self-critical and yet pragmatic education matters today more than ever.” What does this type of education system look like in practice? It doesn’t have to look like only one thing. But the system should explore connections between the primary object of study and the world around that object (broad-based). The classes should ask questions that enable students to judge whether the thing they are learning is worth learning (self-critical). And they should learn how to put their education to work after they leave school (pragmatic). You note in the introduction that you like to employ direct quotations in your teaching and writing. What is your favorite quote from the book? You structure the book around well-known American thinkers and their views on liberal education. * How did you decide which thinkers to include in the book? Who else did you consider including that didn’t make the final draft? Reading Jefferson was very powerful, and I wish I had spent more time on Franklin. Both are powerful thinkers who, of course, were extraordinary actors in tumultuous times. I really just stumbled upon David Walker’s quite amazing pamphlet, though it is well known to American historians. Had I the time to work with Thoreau’s challenges to conventional education, I would have been delighted… The contemporary philosophers Martha Nussbaum and Cornel West are also fascinating to me, as educators who have reflected deeply on their practice. You’ve recently taught two massive open online classes with Coursera (titled “The Modern and the Postmodern” and “How to Change the World”). How has your experience teaching online affected your perspective on liberal education? Many of my friends see profound tensions between online teaching and liberal education. After teaching online, I think they are mistaken. You can teach in a narrow or specialized way online, and you can also teach that way on a campus. Same goes for teaching within the tradition of liberal education. You graduated from Wesleyan in 1978 and became the president of the university forty years later. What changes surprised you most when you returned to head your alma mater? I remember almost no bureaucracy and very few rules. When I was a student I thought departments were irrelevant (because they seemed irrelevant to the real education of students). Coming back, and with my very rosy memories intact, I was surprised to find Wesleyan with some of the structures and silos that many schools have developed in the last 25 years. But with a little more time, I also found great potential for innovation and nimble experimentation — some of it in departments (and even in the administration!). You conclude the book by saying that the “mission of liberal learning in higher education should be to teach students to liberate, animate, cooperate, and instigate.” What measures have you taken as president of California College of the Arts and Wesleyan to support and carry out this mission? At CCA we re-calibrated the curriculum to emphasize learning through the arts — less a trade school and more an institution that recognized that our students learned about the world through the development of skills in architecture, design and the arts. We emphasized the many ways that the arts (and here I include crafts and makers) animated the world, often working in teams that changed the way we took in and responded to the world. At Wesleyan we have a longstanding commitment to learning as a vehicle for liberation (and often for social justice). We have created new interdisciplinary units in environmental studies, east asian studies, the study of public life, integrated science, and film that will allow for new kinds of courses and new modes of teaching. We have also established a Center for Pedagogical Innovation that will explore intensive classes that break away from the conventional academic calendar, and develop blended and online classes. In a word, we have been re-imagining liberal education to show that it can be more relevant, more effective than ever before. One would imagine that it is difficult to balance the responsibilities of being a university president with teaching, research, and writing. What does a typical day in the life of President Roth look like? There are few “typical days” except that business hours are usually full of meetings or trips to visit with donors and other alumni. I prepare my classes on weekends and write in the early mornings or at night. Summers are especially important for reading new material and writing (and rewriting). * Thomas Jefferson, Benjamin Franklin, David Walker, Fredrick Douglass, Booker T. Washington, W.E.B. DuBois, Jane Addams, William James, John Dewey, and Richard Rorty, among others.